Gold inlaid and gold plated Colt firearms are among the most uncommon variations encountered. They were typically reserved for people of means and when the work was performed by the Colt factory, it often increased the purchase price of a standard firearm by a factor or four or more. Presented here are a few Colt pistols that are both factory and period aftermarket gold inlaid and gold plated. Enjoy! 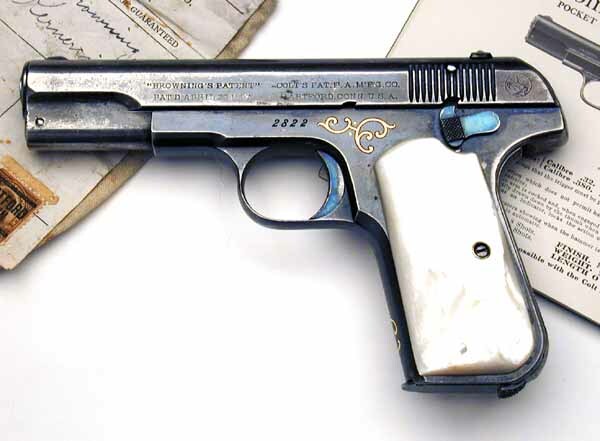 The very first factory engraved and gold inlaid Colt Model M .32 ACP - blued finish with Type I slide markings, six gold inlays and gold monogrammed grip safety with the initials "D.H.P.". This gun was shipped to Browning Brothers in Ogden, Utah in December, 1903. This is also the first Model M produced with mother-of-pearl grips. The engraving, inlay and monogrammed grip safety were masterfully performed by Colt engraver, Cuno Helfricht. Perhaps the most unique aspect of engraving on this pistol is that when the work was performed, no pre-defined styles of engraving existed for the Model M. Just 17 of the Model Ms (in both .32 and .380 calibers) are noted as having any type of gold inlay work. This is the first Model M with factory gold inlay and was featured as a past Gun of the Month. Additionally, this pistol is also the very first Model M shipped with mother-of-pearl grips. 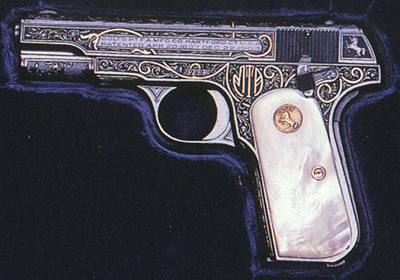 The pistol has six areas of gold inlay and is factory inscribed with the gold inlaid initials "D.H.P." and engraved on the grip safety. This work was performed by Colt master engraver Cuno Helfrict, who also did the first gold inlaid Model N (also featured as a past Gun of the Month.) The gun was shipped to Browning Brothers in Ogden, Utah on December 15, 1903, just a few months into production. I've researched the initials and have written an article about the original owner of the gun which appears in the Spring 2003 issue of The Rampant Colt. Click the photo or the link to read the article. Right side showing gold inlay work on the frame. "D.H.P." monogrammed and engraved grip safety in gold. The very first factory engraved and gold inlaid Colt Model M .380 ACP - Serial number 6580, .380 caliber. Blued finish. 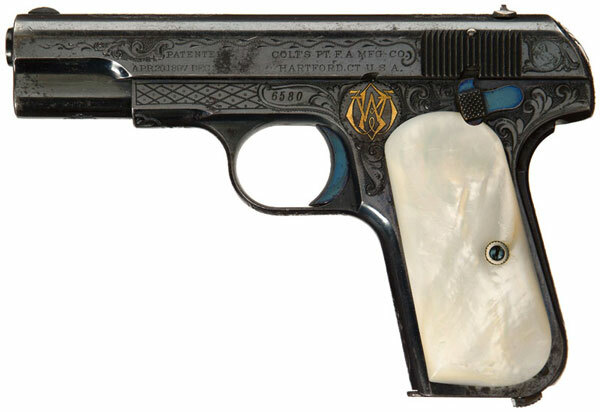 Factory Engraved Gold Inlaid Colt Model 1908 .380 Semi-Automatic Pistol The factory letter shows that this gun was engraved with the initials "WBW" inlaid in gold on the left side of the gun. It was sold to E.L. Benson and shipped to Stauffer, Eshleman & Co. of New Orleans, LA. February 9, 1911. The letter does not mention the grade of engraving (B) or the grips which are pearl with a raised carved eagle on the right side. 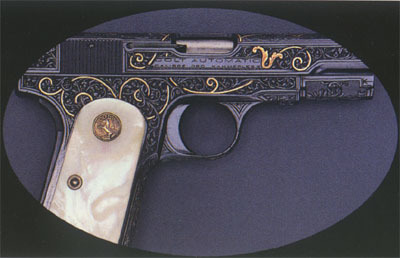 Perhaps the most elaborately engraved and inlaid Model M .380 pistol. Serial number 97482 features full coverage Gough engraving (with distinctive lined background) and gold inlaid monogram (left side of frame) as well as extensive gold inlay scroll work on the frame and slide. The pistol has factory mother-of-pearl with flush medallions that are gold plated. 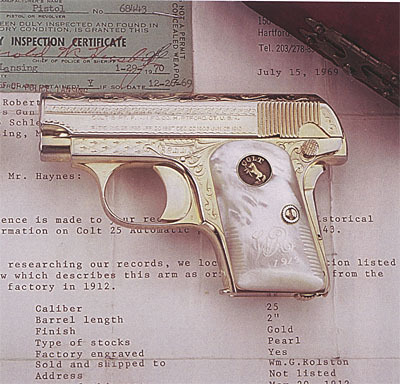 This pistol sold at the November 9, 1999 Little John's Auction in Anaheim, California. Top of Model M .380 serial number 97482. 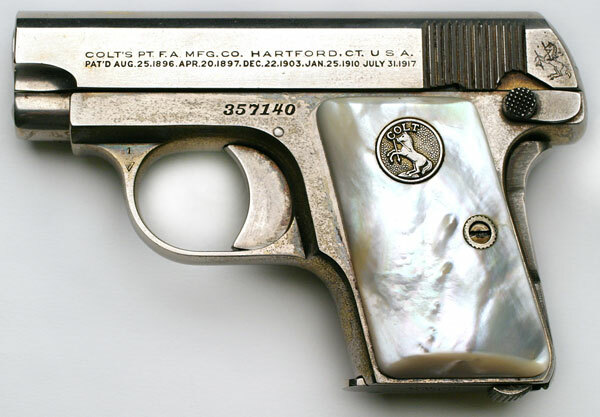 Colt 1908 Vest Pocket .25 ACP serial number 357140 - pistol is factory gold plated and has factory mother of pearl grips with gold plated flush medallions. The gold plating was rather delicate and is very thin on this example as gold finish remains mostly in protected areas. 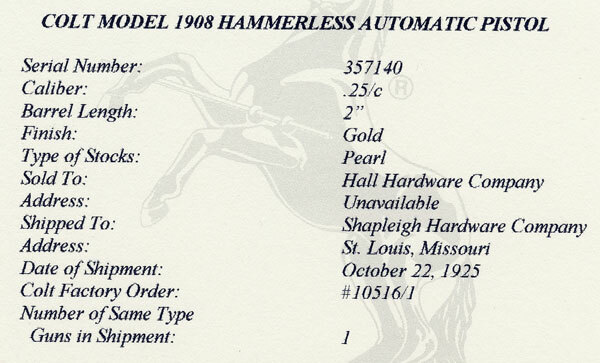 Factory letter confirms these features and indicates that this gun was sold to Hall Hardware Company (address unavailable) and was shipped to Shapleigh Hardware Company, St. Louis, Missouri on October 22, 1925. It was processed on Colt Factory Order number 10516/1. Colt 1911A1 Government Model Serial Number C159001 - Manufactured ca. 1930. 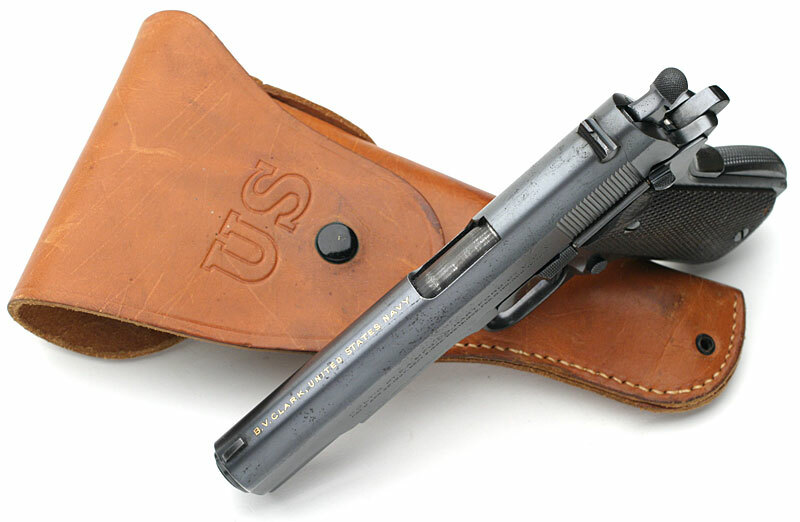 Pistol is inscribed on the top of the slide between the front sight and ejection port "B.V. CLARK, UNITED STATES NAVY". Lt. Baylies V. Clark graduated from the United States Naval Academy in 1930. Lt. Clark was killed during bombing practice at sea on May 23, 1941. Colt 1908 Vest Pocket .25 ACP Gold Plated and Factory Engraved - Serial number 68443 sold and shipped to Wm. G. Rolston, May 20, 1912. The gold finish on this pistol was restored by a previous owner. 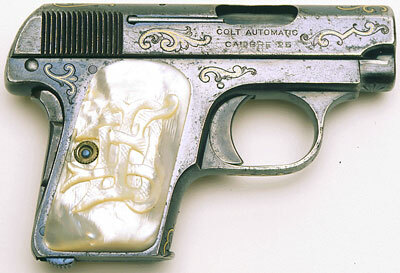 This pistol has mother-of-pearl Colt grips that have been embellished with "W R" and the date 1912. In addition, the grips have rather crude cuts along the edge of each grip, presumably to improve the shooters grip on the pistol. 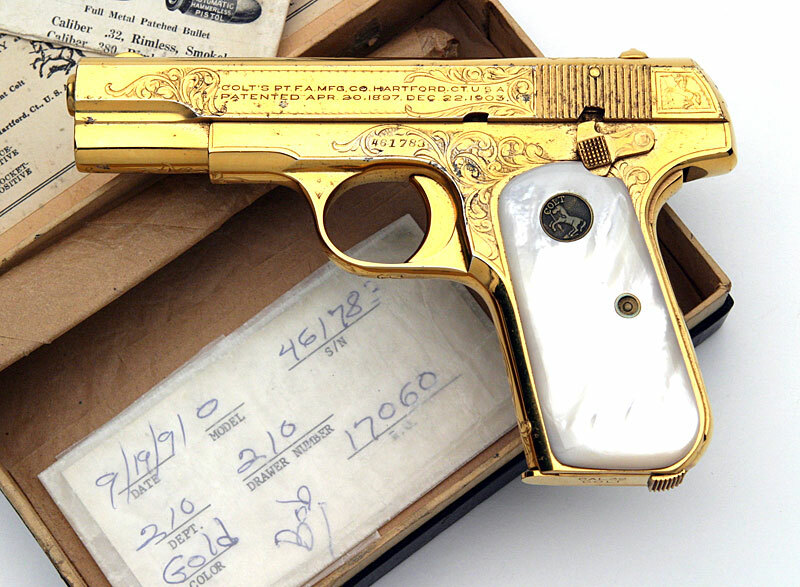 Factory Gold Plated Model M .32 - This special order gun was shipped with mother of pearl grips to Supplee Biddle Hardware, Philadelphia, PA on May 25, 1921 in a one gun shipment. 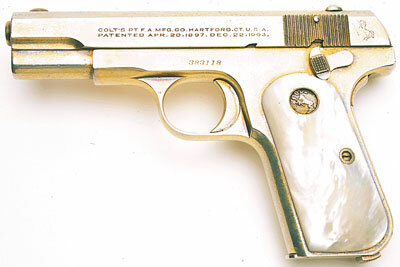 Colt Model 1903 Pocket Hammerless .32 ACP serial number 461783 - Factory engraved and factory gold plated with mother of pearl grips. This pistol originally left the Colt factory in this configuration and was shipped to Quinn & Co., Providence, RI on October 6, 1925. 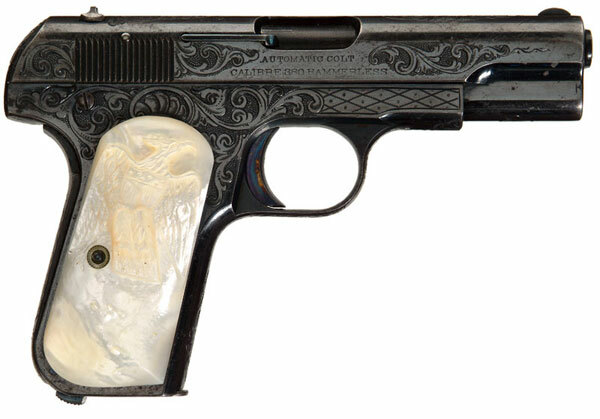 In 1991, it was returned to Colt's for replating and replacement of damaged mother of pearl grips. Note the gun was replated and not polished. The original box label from when it was returned to Colt's is pictured in the bottom of the box. 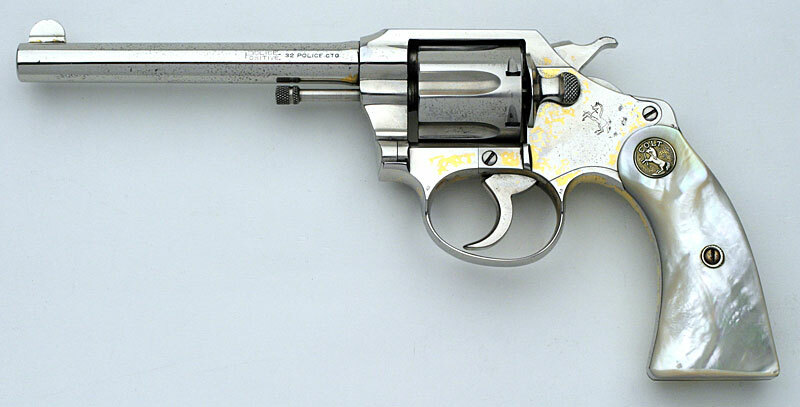 Colt Pocket Positive Serial Number 55523 (ca. 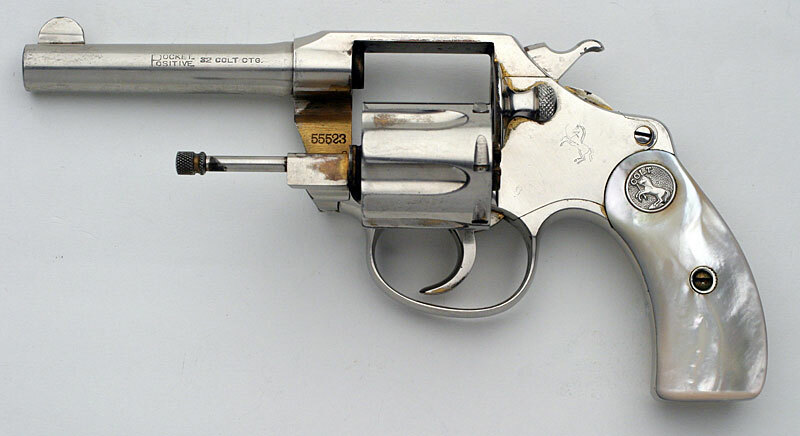 1912) - .32 Police caliber with 3 1/2" barrel and factory nickel finish with what appears to be gold wash and flush medallion mother of pearl grips. This revolver belonged to Harry Bennett. Harry Bennett (1892-1979) was head of Ford’s Service Department, or internal security. He ruled the Rouge Plant, and some say Henry Ford himself, through threats and intimidation, arguably becoming more influential than Edsel Ford, Henry’s son and the company’s President from 1919 to 1943. He first worked in Ford’s art department in 1917, but his “tough guy” manner got him appointed head watchman, and eventually he supervised over 3000 reputed crooks and retired policemen in the Service Department. “The Battle of the Overpass,” Ford’s 1937 response to attempts at unionization, was led by Bennett. Ford fought unionization until 1941. While rumor had it that Ford wanted Bennett to replace him as president, that job went to Henry Ford II, who fired Bennett in 1945. 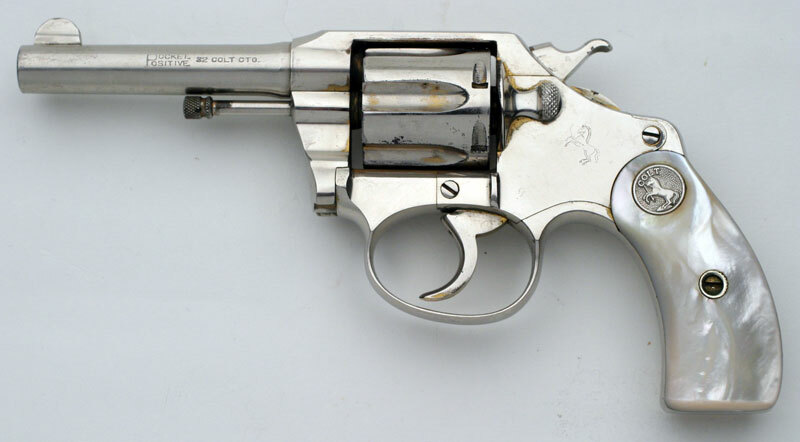 Colt Police Positive Serial Number 206438 with 5" barrel (ca. 1924) - Gold plated finish over nickel, flush medallion mother of pearl grips with gold plated medallions. Barrel is marked "Police Positive .32". Factory letter confirms these features and indicates revolver was shipped to Walbridge & Co, Buffalo, NY September 23, 1924 with gold finish and mother of pearl stocks. 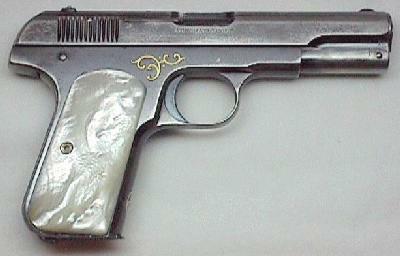 Pistol was a single gun shipment and was processed on Colt factory order number 8876/1.